Nora Twomey’s ‘The Breadwinner’ and Damien O’Connor’s ‘Angela’s Christmas’ have been nominated for awards at the 2018 Emile Awards. ‘The Breadwinner’ is nominated for Best Direction in a Feature Film and Best Character Animation in a Feature Film and ‘Angela’s Christmas’ received nominations for Best Soundtrack in a TV/Broadcast Production and Best Sound Design in a TV/Broadcast Production. Irish co-production ‘Captain Morten and the Spider Queen’, the first stop-motion animated feature, which is produced by Galway’s Telegael also received two nominations for Best Direction and Best Character Animation. ‘The Breadwinner’ tells the story of eleven-year-old Parvana, who gives up her identity to provide for her family and to try to save her father’s life. A story of self-empowerment and imagination in the face of oppression, the film also celebrates the culture, history and beauty of Afghanistan with a cast that includes many performers of Afghan descent. Since its world premiere at the prestigious Toronto Film Festival (TIFF) in September 2017, ‘The Breadwinner’ has achieved immense success on the international stage. The film was nominated for Best Animated Feature at the 2018 Academy Awards and Golden Globes and garnered ten Annie Award nominations; taking home the ceremony's accolade for Best Animated Feature, marking the first time a solo female director has won in this category. The half-hour CG film is written by Will Collins and Damien O’Connor and is based on Frank McCourt’s only children’s book inspired by a story his mother Angela told him as a child. In 1997 McCourt won the Pulitzer Prize for his best-selling memoir, Angela’s Ashes. Angela’s Christmas stars Ruth Negga in the role of Angela’s mother and Lucy O’Connell as Angela. 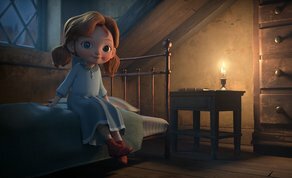 ‘Angela's Christmas’ was developed with the support of Screen Ireland and produced by Brown Bag Films with the support of the Broadcasting Authority of Ireland and RTÉ. 9 Story Distribution International holds worldwide distribution rights. ‘The Breadwinner’ is produced by Paul Young of Kilkenny’s Cartoon Saloon (‘Song of the Sea’, ‘The Secret of Kells’) alongside Canada's Aircraft Pictures, and Luxembourg's Melusine Productions and Angelina Jolie serves as the title’s executive producer. The Breadwinner was developed with support from Telefilm Canada, Screen Ireland, the Film Fund Luxembourg, Corus Entertainment, the Harold Greenberg Fund and the Belinda Stronach Foundation. The Emile Awards celebrate excellence and diversity in the European animation film industry. Winners of the Emile Awards will be announced at an awards ceremony in Lille, France on December 8th.